Produced by The Heirloom Sauce Company this Gran Luchito Mayo was very kindly sent to us with some other goodies for me to try. The recipe is originally from Cocina Oaxaca City in Mexico. Please excuse my ignorance, but I'd never heard of Gran Luchito until I first saw this mayonnaise and quickly found out from the internet that it is a smoky Mexican chilli paste. I decided to give Gran Luchito Mayo a try on a big fat burger with chunky potato wedges on the side. On opening the jar I found that this mayonnaise was a pinkish colour, with a few small dark bits mixed within it, which I figured were small pieces of chilli. I heaped a big pink dollop on my burger and another slightly larger pink blob next to my potato wedges. The Gran Luchito Mayo had a smoky fiery chilli taste mixed with a mild rapeseed oil and balsamic vinegar flavour. This mayonnaise had a good medium hot chilli heat to it. I thought this Gran Luchito Mayo was very tasty with its smoky chilli and slightly sour mayonnaise flavour. It went equally well with both the burger and the potato wedges dipped in it. I couldn't help slopping on as much of this mayonnaise as I could get onto each potato wedge. I went back to the jar for several more pink blobbed servings too. I had a sweaty nose and my tongue was tingling pleasurably with the chilli heat. The Gran Luchito added a smokiness and chilli burn to the burger, whilst the mild sour mayonnaise flavour completed its lettuce dressing. I look forward to eating the rest of this Gran Luchito Mayo on another burger with chips in the future. This smoky chilli mayonnaise definitely has a thumbs up from me! Made with rare smoked Mexican chillies and free range eggs. 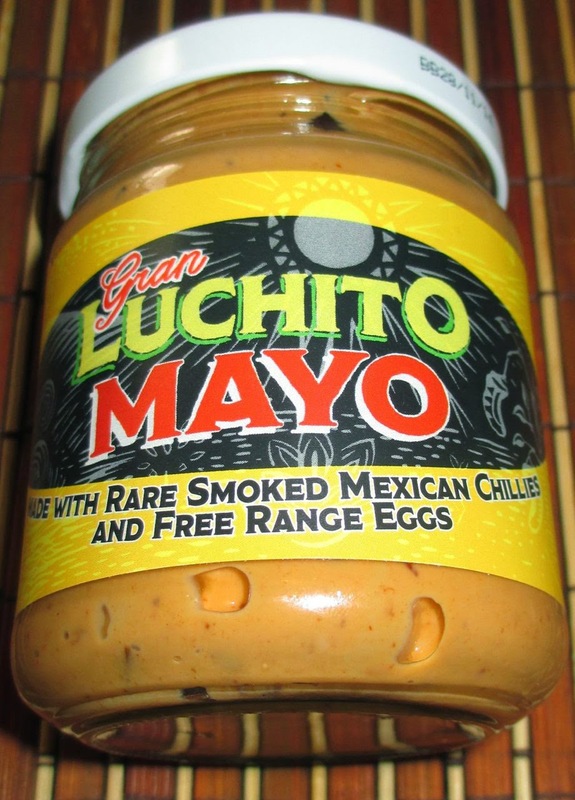 The label recommends you try this Gran Luchito Mayo spread on hot toast with chopped ripe avocado (not keen on avocado though!) and a poached egg (prefer fried eggs!). See photograph for ingredients.